Kompact Kamp is a relatively small company established in 1981 in Myerstown (PA). Over the years the company gained well-deserved recognition for series of motorcycle trailers including the best-seller Mini-Mate Camper as well as traditional cargo trailers. Recently the company also included in its offer a pet trailer overwhelmingly welcomed by most animal lovers from bikers’ community…. As expected these days – the body of the Kompact Kamp’s Mini-Mate pop-up camper (as well as all other trailers) is made from molded fiberglass. 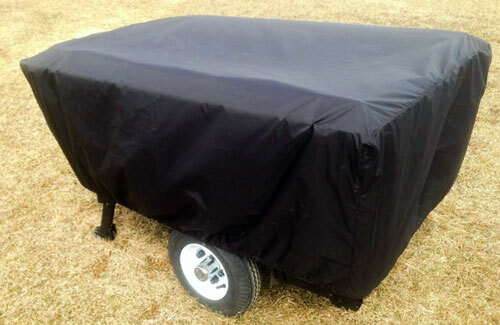 Thanks to composite materials the trailer is not only extremely lite (main goal for all motorcycle campers), but also durable and weather-resistant. It is designed with a lot of attention to every detail because frankly, in the case of motorcycle trailers there is no much room for any “overdesigned” feature or unnecessary “gadget” that at the end will result in extra weight and possibly decreased reliability. A good example of “thoughtful” engineering effort can be seen in trailer’s suspension. The independent rubber-torsion suspension follows the rule of “better is enemy of good enough”. Indeed it simply does the job, yet is shaves off a lot of weight compared to traditional (and let’s face it – more robust) leaf-spring suspension with shock-absorbers. The Mini-Mate is a pop-up camper with sleeping area made from canvas similar to traditional tent. To add extra weather protection - the roof is made from vinyl. Not accidently or for “beauty” reason – the roof is white as it better reflects sun’s radiation (property much appreciated during hot sunny days). While for obvious reasons (weight and space) there is no any “magic” button opening the tent, the whole operation to set-it-up or pull-down is very simple and can be finished in just about 2 minutes. 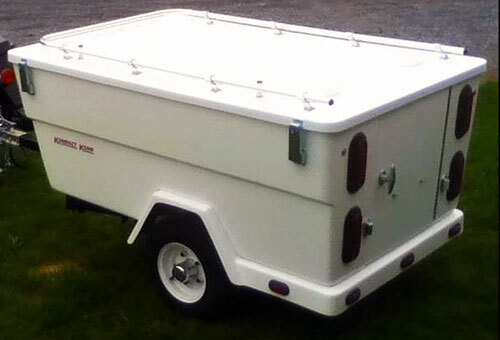 You just open the reinforced fiberglass lid (attached by hinges to the trailer’s body), insert the U-shaped support tubing (otherwise part of the luggage rack) and then flip it over. 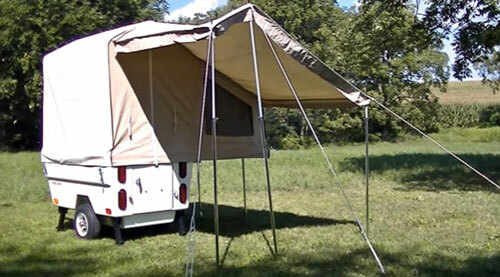 The tent partially opens up thanks to three bows permanently hinged to the trailer’s body. You just have to insert two telescoping twist-locking rods in their place and the sleeping room is ready. Actually, once you “master” this process it is “almost automatic”! 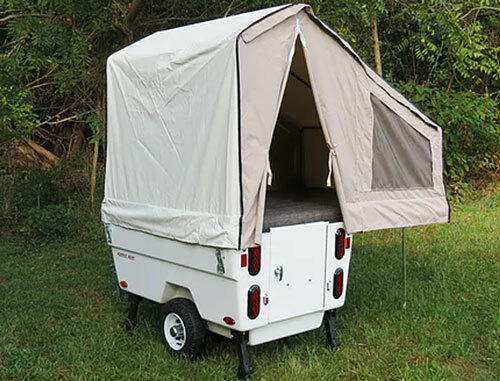 The Mini-Mate camper is designed for two persons (bed size 54” x 78”). The sleeping area is cleverly designed. The section of the sleeping area extending over the trailer’s main body (lid supported by U-shaped tubing) is not exposed to the full weight of two sleeping persons but rather to the weight of their legs. Assuming “right body orientation”, the main weight is taken by the trailer’s body supported by wheels and four stabilizers. It makes the sleeping area very stable! Another simple but very practical feature is the “dressing area” at the entrance. To open it up, you have to remove part of the bed next to the entrance doors. 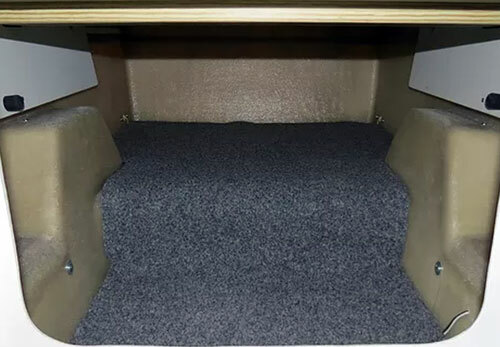 Thanks to lowered section of the floor it offers 76” headroom, making it easier to get in and out of the tent as well as to stand up to dress/undress. Actually, the importance of full-height covered entrance cannot be overestimated, especially in days marked by unfriendly weather. You can use it for sitting after converting the front-half of the bed into cushioned bench with back rest….. The manufacturer offers several optional features of which the most useful seems to be 5ft x 7ft awning (zipping into the tent). It effectively expands the living area well beyond the tent limits offering weather-protected and at the same nature-connected space. While traditional ground-based tents may provide more space, windows, storage pockets…., when the rain starts pouring and the mud splashes out we all know very well that it feels good to be above the ground. And this is a major advantage of any tent pop-up camper. 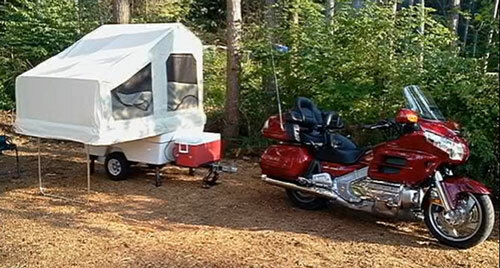 The Mini-mate pop-up camper with its dry weight of only 265 lbs is light enough to be towed by mid-sized motorcycles (provided cargo within their towing limits). Obviously the Mini-Mate is towable by all bigger bikes (Gold Wings, BMW, Yamaha FJR - likes…), tricycles, not mentioning micro-cars (Smart…). It may be worth to mention that the camper in its road configuration (folded) is only slightly wider (about 1 inch) than bikes’ hand guards so you do not need extra attention when driving. 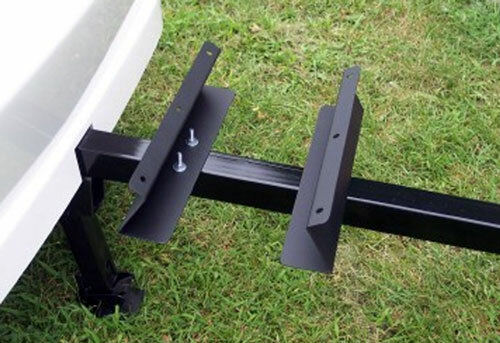 It is important however to remember that the breaking process when towing the camper is the “tricky” operation. It’s fine when the bike and trailer are aligned. But when it is not the case, the dynamic lateral force applied by the trailer on the hitch during sudden breaking can be surprisingly nasty…. So be careful! Storage space 15 cu. ft.
Summarizing: The Mini-Mate pop-up camper proves that small and simple can not only be beautiful, but also very useful.